PT Pertamina Hulu Mahakam - PHM is a well-established oil and gas company in Indonesia with core business competencies in upstream business. PT Pertamina Hulu Mahakam operates primarily as the Operator of the Mahakam Working Area (WK Mahakam). PT Pertamina Hulu Mahakam is an integral part of PT Pertamina (Persero), the national oil company of Indonesia. PT Pertamina Hulu Mahakam is a directly owned subsidiary company of PT Pertamina Hulu Indonesia, an upstream subsidiary of PT Pertamina (Persero). Officially starting on 1 January 2018, PT Pertamina Hulu Indonesia through PT Pertamina Hulu Mahakam will manage WK Mahakam Block from its previous operator, Total EP Indonesia, with a contract period until 31 December 2037. As of January 2018, WK Mahakam has more than 1700 KM of Pipelines, 103 GTS & Clusters, 26 Offshore Platforms, 6 Processing Areas and supported by 3441 Employees. Copy of academic transcript with minimum GPA of 3.00 (scale 4.00) or equivalent. Copy of English standard test results with minimum requirements paper-based TOEFL 500/TOEIC 600/IELTS 5.5 or equivalent. Application letter/proposals and apprenticeship objectives in English language. Letter of recommendation from the previous educational institution (if any). Copy of proof of participation of BPJS Kesehatan or other health insurance (mandatory for all participants). JobsCDC.com now available on android device. Download now on Google Play here. Please be aware of recruitment fraud. The entire stage of this selection process is free of charge. 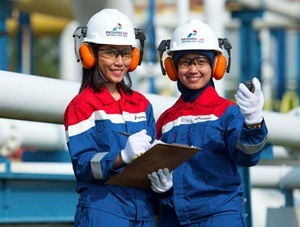 PT Pertamina Hulu Mahakam - Apprenticeship Program Pertamina Group April 2019 will never ask for fees or upfront payments for any purposes during the recruitment process such as transportation and accommodation.